A Dozen Ways to Increase Customer Conversion; Online & In-store. For each product, 60% to 90% of its buyers research that product on the Web prior to purchase. Product marketers that are harnessing the power of the Web to establish their product as the benchmark for comparison in the category are achieving higher customer conversion rates than competing products both online and in-store. Drawing from real life case studies veteran marketers from four industry leading online marketing companies (WebCollage, TOUR Anything, Create/Send E-mail & Blue Volt) have contributed to developing this 25 minute presentation, which shares valuable tactics that major-brand clients are using to increase product sales. Insight will be shared on content development, message development, online syndication, e-mail marketing, on and off line conversion, best technologies, deployment and rapid training. Tactics for harnessing the web’s power to increase product sales. For each product, 60% to 90% of its buyers research that product on the Web prior to purchase. Product marketers that are harnessing the power of the Web to establish their product as the benchmark for comparison in the category are achieving higher customer conversion rates both online and in-store than competing products. We’ll present and discuss today’s most effective tactics on how to use the Web to increase product sales. 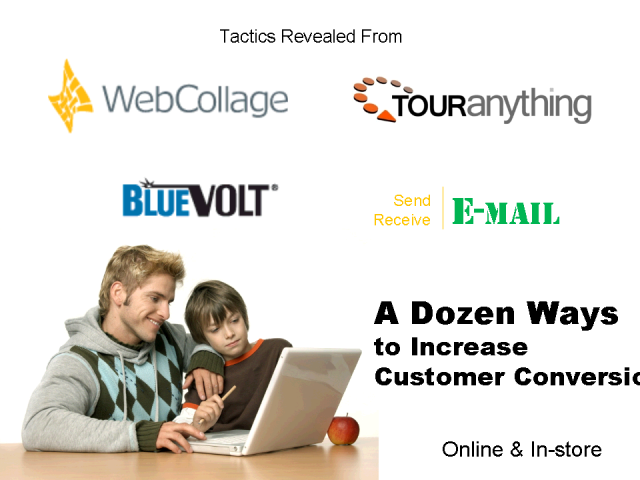 Title: A Dozen Ways to Increase Customer Conversion; Online & In-store.